Goodness, I love this print. Some of the bikes have little tweeting birds on the handlebars, and the bikes have what appear to me to be hearts on the fronts. Too fun. I do kind of wish they were boys bikes, since the ties are for men and boys but I think, especially in the bow ties, that that isn't really noticeable. 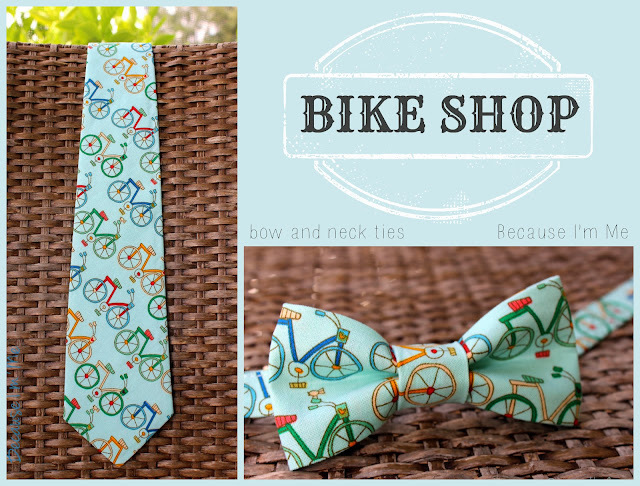 The ties are available in the shop. Another new and kind of exciting addition to the shop is an expedited production and shipping option. I can't count how many ties I've had to rush for weddings lately, so this is a wonderful option to have. Normally I have to either set up a reserved listing or wait until customers pay for their items, then send a paypal invoice, then hope they get that paid before the mail goes out - lots of steps that don't always happen quickly enough to meet the customers needs. This option is MUCH better. I hope Etsy will eventually allow multiple shipping options per listing (pretty please) but in the meantime allowing an shipping upgrade listing is nice to have.